A living history organization that honors the common fighting men and home-front civilians on both sides of the American Civil War. We preserve history through research, interaction, and education. Founded in 1999, the Liberty Rifles (LR) is a group of living historians who strive to accurately portray the common fighting men and home front civilians of the American Civil War, while excelling in terms of authenticity and organization. We constantly seek opportunities to educate ourselves and others about the sacrifices and experiences of our ancestors. The LR was founded to represent soldiers and civilians on both sides of the war with equal accuracy and honor. June 2018 – Two photo albums: "Prelude to Invasion" and Prelude to "Prelude to Invasion"
We believe that to be true historians we must approach history in a non-political and unbiased manner. Our goal is to learn more about the brave patriots of both sides of the war by accurately emulating them in terms of both our attire and our actions. To do this, we do extensive research on period accounts, written histories, historical sites, and original artifacts to comprehend and replicate the period to the best of our ability. Authenticity is our perpetual journey and we strive to continually improve our portrayal of 1860s soldiers and civilians. We hope that our members and those interacting with our group gain a correct vision of the hardships endured by our fore-bearers. We draw most of our members from the mid-Atlantic states and have individual members from as far away as the West Coast and Northeast. Military members come together on the field to act as one well-drilled, veteran military unit, and civilians gather to portray those affected by the war off the battlefield. All members adhere to the Liberty Rifles Bylaws, and the policies and guidelines set forth by our umbrella organization, the 3rd Battalion of the US Volunteers. We regularly participate in both public and private events, each with its own purpose and goals. Public events are geared more towards demonstrating the life of the common soldier for visitors and often take place on original battlefields or historic sites. In past years, we've planned public historical programs at sites throughout the Eastern Theatre, from Manassas to Petersburg. The private events in which we host or participate focus on a more immersive environment that provides participants with a fully encompassing scene from 1861-1865. Recently we've hosted several of these style events at Point Lookout, MD and a recreated winter quarters camp in Virginia. 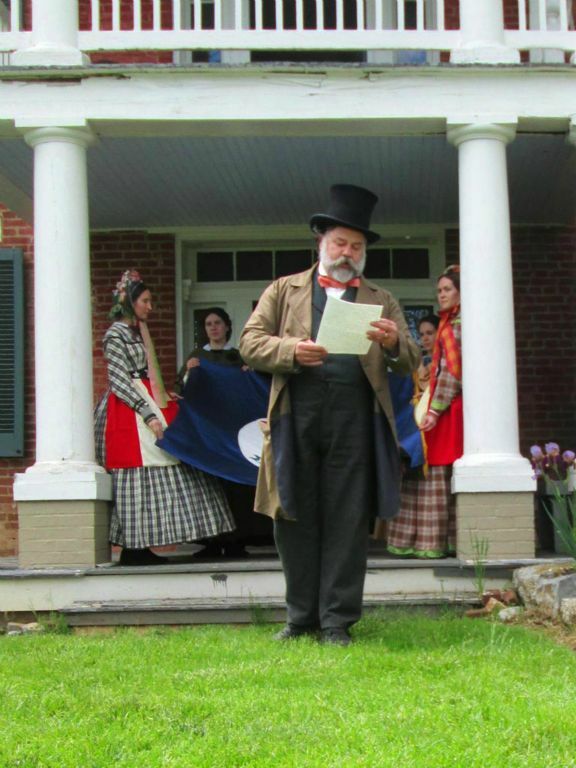 During the 150th Anniversary of the Civil War in 2011-2015, the LR attended and hosted a wide range of living histories, high quality reenactments, and immersion events. We worked closely with the National Park Service to provide an accurate visual portrayal of troops at numerous official anniversary commemorations, and also raised many thousands of dollars for donation to the Civil War Trust for the preservation of battlefield land. Each year, the LR also hosts two narrated historic walks at Gettysburg National Military Park, typically following the footsteps of a Confederate regiment during the anniversary weekend in July, and then a Federal regiment on Remembrance Day in November. These programs are completely researched, coordinated, and led by group members, and are always open to spectators and our friends within the reenacting community. We're looking forward to the next season of events, and whether you're a visitor or participant, we hope to see you there!